Since it’s comfort food season, I’ll occasionally throw in chili, tomato soup & grilled avocado & cheese sandwiches, or minestrone and paninis into our dinner mix. Mac and cheese is another easy staple to add as a side dish. 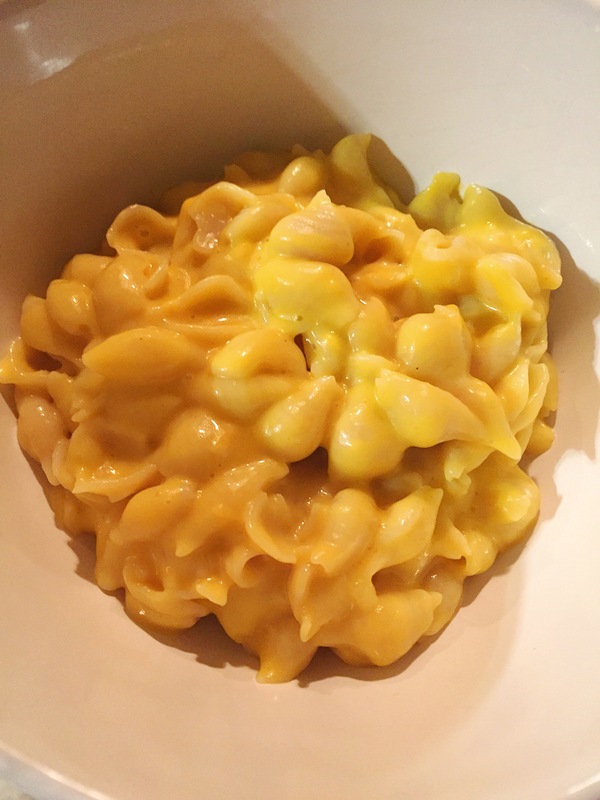 I’ve tried countless vegan mac & cheese recipes and they usually require a ridiculous amount of ingredients and never resemble the cheesy comfort dish. So I got basic and created my own, the same way I make it for my family, using only 4 ingredients and the result is amazing! This isn’t the type of measured recipe, but it’s super simple and can be made all in one pot! To add to the deliciousness, drizzle black truffle oil on once served! Boil the brown rice pasta until cooked. Strain, rinse in strainer and return to pot. Add 1-2 TBSP butter, and stir until melted. Add cheese by the handful as you are stirring, until melted and reached desired cheesy consistency. Add Cashew milk for creaminess, while stirring. Sprinkle salt and pepper to taste. Serve in bowls and drizzle with truffle oil.